The Netherlands is one of the few European nations which still has a constitutional monarchy and since I am from the Netherlands myself this page cannot be missing from this website! 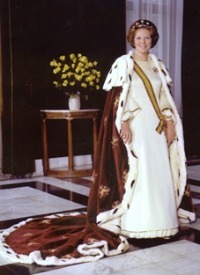 Until recently the Kingdom of the Netherlands was ruled by Queeen Beatrix, but in January 2013 she announced her abdication in favour of her son Prince Willem Alexander. Since then, the coronation has become a national obsession and is the talk of the day. Questions like what boat they will use, what will the ‘King’s song’ be, who will be attending the various ceremonies are explored in depth by all forms of media. Here are some of the Dutch Regalia symbolising the kingdom of the Netherlands that will be present at the ceremony, the crown, the globus cruciger and the sceptre, all made in 1840. My personal favourite story to do with the coronation is that of what ever happened to the real Royal Mantle. 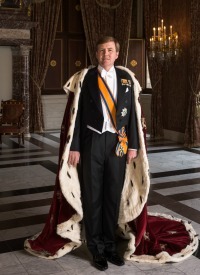 According to the Netherlands Government Information Service the mantle that will be worn by Willem Alexander is the same royal mantle that was made for the coronation of King Willem I. 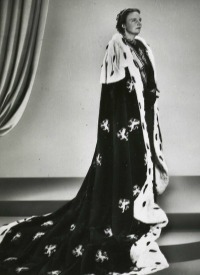 In the media the story is persistent that the mantle was replaced by another one in 1948 for the coronation of Queen Juliana, since the original mantle perished. If you are interested in the official version of it all and find answers to all your questions regarding the Abdication and Investiture please visit the official website of the royal house of the Netherlands. 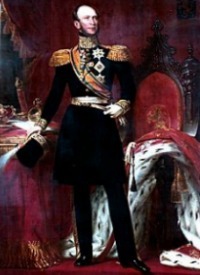 On 30 April 2013 the throne has gone to King Willem Alexander, the first Dutch King since King William III who died in 1890. 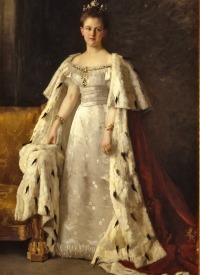 For more than 100 years Queens reigned the Kingdom of the Netherlands. To me, the mantle looks to good to be almost 200 years old! 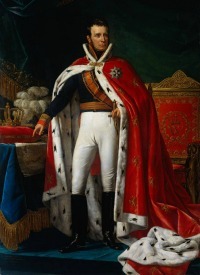 Until 30 April 2013 Willem Alexander was the Prince of Orange. 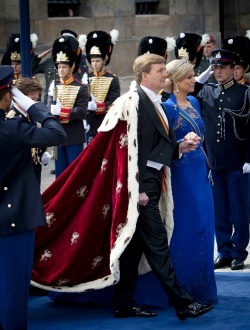 After his coronation he is King of the Netherlands and his daughter Catherina Amalia is the Princess of Orange. The title prince(ss) of Orange is only used by the first in line to the throne of the Kingdom of the Netherlands. Before the change of law in 1983 this title was only intended for male heirs, so princess Amalia is the first female to carry this title. Princess Maxima will be named Queen Maxima, as according to Dutch tradition the wife of the king is always referred to as Queen. She will not be, and never will be, head of state however. The heir apparent is Princess Catharina-Amalia. 30 April 2013 was the last time Queens day was held in the Netherlands. On that traditional Dutch holiday Queen Beatrix abdicated in the Royal Palace Amsterdam. The inauguration of Willem Alexander took place in the New Church, also on the Dam in Amsterdam. His wife Princess Maxima became Queen of the Netherlands. 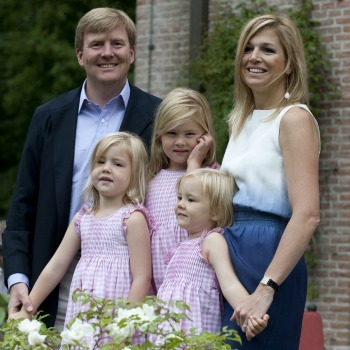 Starting 2014 the Dutch national holiday will be celebrated on April 27th, the birthday of Willem Alexander. 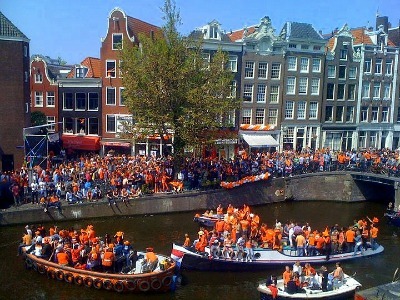 Queens day is always severely celebrated in the Netherlands, especially in Amsterdam. Since 2014 King's day is celebrated just as much, on April 27. If you want to find the best deals on Amsterdam hotels for this event you better start looking early! From Amsterdam lots of trips and tours can be taken, in Amsterdam or in the surrounding Dutsch countryside. Tips are the windmills at Zaanse Schans and the Keukenhof Gardens. Of course tours to the palaces in and around Amsterdam are also an option! 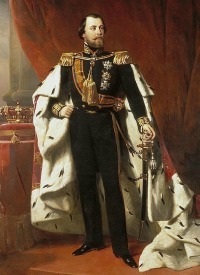 The Netherlands has been a kingdom only since 1815 when Willem Frederik (King William I) became King of the Netherlands. Before this the country was ruled by the princes of Orange and Nassau and they ruled as Stadtholders (except for the periods when the Netherlands ruled by foreign occupiers). Although the kingdom is young they are one of the only 12 monarchies in Europe that still exist today. The role of the Dutch monarchy is mostly ceremonial these days, the power of the monarch is limited. The royal palaces in the Netherlands are property of the Dutch state. Since the royal family is still using some of them they are not all open for visits. The King uses three palaces; he lives in Huis Ten Bosch in the Hague, Noordeinde Palace in the Hague is the working palace and the royal palace on Dam Square in Amsterdam is used for official meetings and ceremonies. Only the latter is open for visits. Paleis het loo is the home of Princess Margriet (the sister of Princess Beatrix) and her family. She lives in ‘het Loo House’ that is on the grounds of Het loo palace. The palace is used as a museum and is open for visitors, as well as the gardens. There are however many castles and palaces, country houses and estates in the Netherlands that are privately owned and that are also worth a visit.